This post is about a great piece of recent research on school resegregation. I want to talk about the content of the article itself as well as the value, more generally, of research that relies on interviews and media analysis to understand the current moment with regards to race and schooling. I think this kind of research can tell us a lot about how things have changed, how things have stayed the same, and about how we might make progress in the future. Research that measures school resegregation numerically or statistically has made its way deep into public discussion. Many - even mainstream - media outlets cite research findings that schools in some parts of the country are as segregated as they were in the 1960s, for example. And that’s great. Meanwhile, research that’s more qualitative (e.g., interviews and observations) is yet to approach this kind of impact. (See this piece for a much better, more holistic definition of qualitative research than I have the space for here.) While statistical/quantitative studies can be relatively straightforward, it can be harder to describe the purpose of qualitative research for those who aren’t already on board. Qualitative research doesn’t “measure” as much as it documents lived experience or illuminates important aspects of the cultural context around the numbers. That can be harder to put into a quick headline. Perhaps as a result, it’s less common to find discussion of qualitative research in this field, which brings me to the specific piece I want to review here. The article -- The Disintegration of Memphis-Shelby County, Tennessee -- looks at an extremely important (and currently unfolding) issue: school district secession. It was published in one of the most highly regarded education research journals by three very well-known researchers in this field - Genevieve Siegel-Hawley, Sarah Diem, and Erica Frankenberg. The article focuses on the 2014 secessions and asks: how did this happen? How did political figures justify the decision to secede? The researchers interviewed people who were involved in the decision or who were affected by it, including members of the county’s transition planning commission as well as school board members, school administrators, other education researchers and activists. Colorblind language. The authors observe that “local control, in short, became a favorable way to discuss the preservation and accumulation of resource advantages that mapped on to existing racial cleavages.” Of course, we saw exactly the same thing last week, in a North Carolina law that allows white towns essentially to secede (or, really, to wall themselves off) from Charlotte city schools. And we see similar language used all the time by Secretary DeVos. These are just samples. There’s much more in the piece, including race-conscious research and policy recommendations that I don't have the space to summarize here. One of the authors also took to Twitter to summarize the piece. In all, it's new research that thoroughly demonstrates that arguments about local control are really arguments about race -- that the boundaries of what counts as “local” are racialized (e.g., not “the city”) and that the feeling of needing “control” itself is racialized (e.g., control over the continued accumulation of resources for white communities, or control over access to what is viewed as a limited, individualized, competitive resource). To advance policy, you have to make an argument of some kind, and it’s no longer acceptable to make an argument for secession that is explicitly about race. So instead, secession advocates have to use coded language. This research defines that coded language in detail and provides the insight necessary not only to puncture holes in today’s prevailing arguments but to promote better arguments - and specific policy strategies - for a race-conscious approach to public education. I hope this will catch on in the public discussion as much as startling statistics about how far we’ve regressed already have. In the last update, I wrote about a promising school integration lawsuit in New Jersey. This week, the news is not as good: On Wednesday, North Carolina passed a law – #HB514 – that will allow 4 majority white suburbs of Charlotte to secede from the countywide Charlotte-Mecklenburg school system. Although secession efforts have been common across the country recently, this one is unique for at least two reasons. First, other places have sought to secede by splintering smaller public school districts off from a larger/more diverse district (e.g., Gardendale, AL, Memphis-Shelby County, TN). However, the NC law uses charter schools as the vehicle for secession. It authorizes charters specifically in 4 suburbs, allows them to limit enrollment in these schools to municipal residents. The graph below shows the suburbs and their racial compositions. Second, one barrier to secession via charter school is that there are more restrictions on the use of property tax revenue for things like school building construction. But the NC bill takes care of that by including a provision that allows town governments to indeed use public funds for charter schools the way they would for traditional public schools. Previously, only county governments or the state had the power to spend money this way. “How is this an issue of race?” I’ll attempt to answer the question by taking a broad look at the history of segregation, integration and then re-segregation in Charlotte and its schools. To start, we have to look way back at the turn of the century, because events then still resonate today. This great piece in the Atlantic notes that segregation in Charlotte (as in so many other places) had to be invented. Between the end of the Civil War and 1899 (when NC passed its first Jim Crow law), “black and white people lived next to each other in Southern cities, creating what the historian Tom Hanchett describes as a ‘salt-and-pepper’ pattern.” Wealthy political elites were concerned about a growing political alliance between low-income blacks and whites, so they encouraged residential segregation as a way to, well, divide them. Nearly 30 years after busing began in Charlotte, school integration received a devastating blow. A white parent filed suit against the city, claiming that his daughter had been denied admission to a local magnet school because of her race. In that case – Capacchione v. Charlotte-Mecklenburg – a federal judge ruled that the segregated “dual system” in the Swann case was no longer in existence. In a haunting piece of foreboding, the deciding judge wrote that “racial imbalances existing in schools today are no longer vestiges of the dual system; and that it is unlikely that the school board will return to an intentionally-segregative system.” That decision was later upheld in an appeals court. Busing ended, and resegregation accelerated rapidly. A recent report found that Charlotte-Mecklenburg is by far the most racially segregated district in the state. 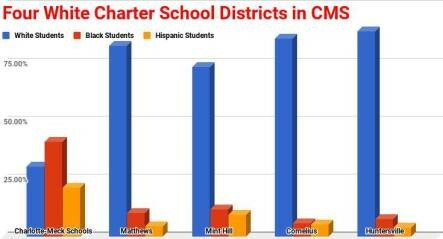 To achieve racial balance today, more than half of the students in CMS would have to be reassigned to different schools. And we shouldn’t lose sight of how school segregation ripples through virtually all aspects of social life. This fantastic piece by Clint Smith connects school segregation to the police shooting of Keith Lamont Scott and the protests that followed his death. Smith notes “In Charlotte, the chances of black males coming into contact with the criminal-justice system increased with the resegregation of their high schools.” There’s a lot in his piece that can’t be summarized her -- I highly recommend a full read. Over the last 15 years, the proportion of white students in NC public schools has decreased, while the proportion of white students in NC charter schools has increased. I just don’t see how this bill could be separated from the history here. After Brown, there were pitched debates about things like school district boundaries and the use of public funds (at the time, it was vouchers) to finance white flight. Although the specific policy mechanisms are different, the debate today still centers around similar core issues. 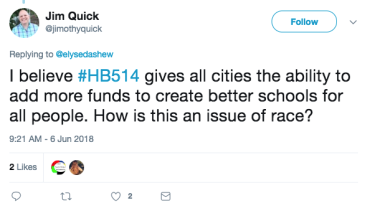 However, proponents want us to believe that HB514 is somehow disconnected from the history outlined above, claiming that the law is about things like local control or choice -- definitely not about race. Could anyone believe this?